In Florida outdoor living is a wonderful part of your life. Our team is at your service to assure you a seamless and professional project that meets your needs. Whether you are screening in a pool, a deck or a porch, Premier can handle the design and build out of the project. Screen enclosures expand your home’s square footage for a fraction of the cost of typical construction. Screened enclosures provide a maximum amount of visibility and living area combined with comfort and convenience. Premier has the experience to handle your project, no matter what the size or design requirements. 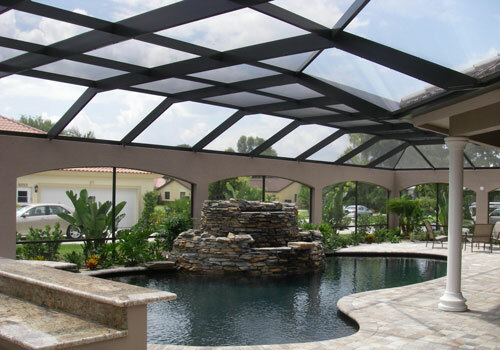 Entertaining outside is a popular pastime in Florida – and a custom designed enclosure is perfect for this. Indoor amenities add to the charm of the room. People and guests want a clean and shaded environment that is outdoors yet protected from the elements. Breakfast and dinner are favorite meals at your new outdoor lifestyle. We offer an array of options from which to choose resulting in an outdoor living space that is perfectly suited to your needs and your home’s architecture.